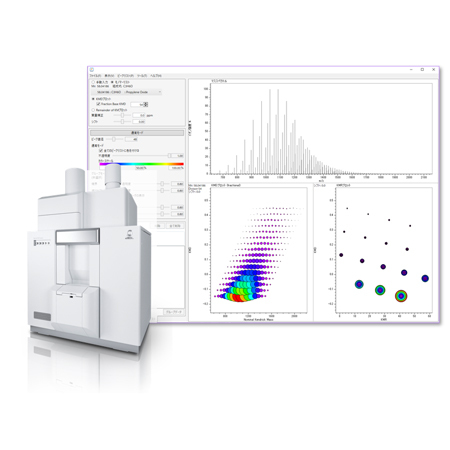 msRepeatFinder Polymer Analysis Software | Products | JEOL Ltd.
Visualizes complicated mass spectral data and accelerates information sharing! 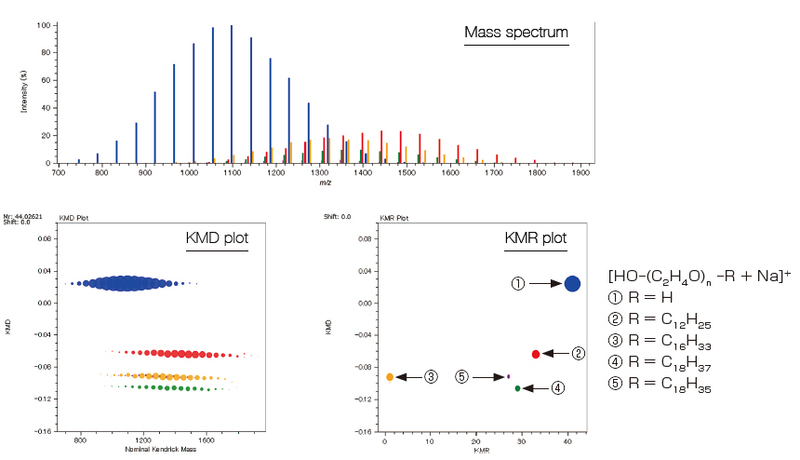 msRepeatFinder combines Kendrick Mass Defect (KMD) and Kendrick Mass Remainder (KMR) plots to visualize compositional distributions of homopolymers with different end groups. The program also calculates parameters related to molecular weight distributions by grouping and color coding each polymer series. 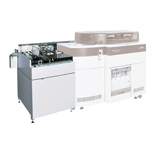 To analyze highly polydisperse polymers, it is effective to combine GPC with high mass-accuracy MALDI-TOFMS. 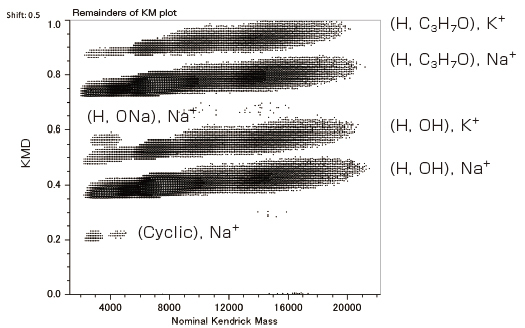 This process displays mass spectra of multiple fractions on Remainder of Kendrick Mass (RKM) plots for visual presentation of compositional distributions. High energy collision-induced dissociation, which is a fragmentation method specific to MALDI-TOF-TOF, is effective in acquiring various structural information. RKM plots can visualize the difference of end groups. 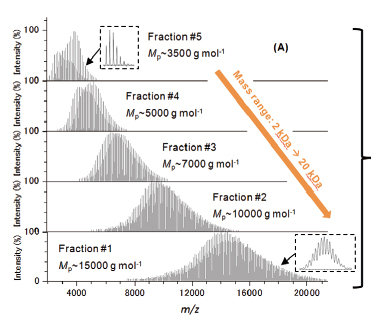 In mass spectral data of copolymers, numerous peaks with small mass differences are typically observed. Fraction Base KMD plots can clearly visualize such peaks compared to conventional KMD plots. In FD, types of polymers to be desorbed and ionized change over time as the current to the emitter is increased. In KMD plotting, polymers separated over time can be overlaid for visualization. The effectiveness of processed results is determined by the mass accuracy of peak lists provided. Microsoft® Windows® 7 Service Pack 1 (64 bit) or Microsoft® Windows® 10 (64 bit). 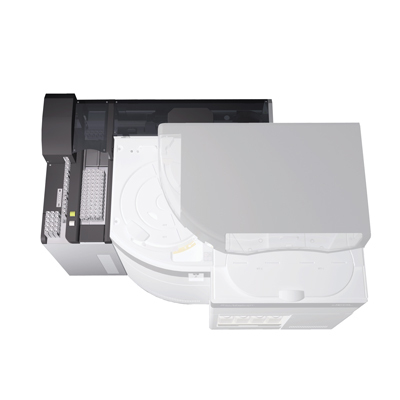 For the PC, MS-57043PCJ or equal is recommended. Microsoft, Windows, PowerPoint and Microsoft Office e registered trademarks or trademarks of Microsoft Corporation in the US and other countries. Microsoft Word is the product name of Microsoft Corporation.